Fourth Amendment protections against unlawful search and seizure have been upheld in two recent landmark Supreme Court rulings related to the searches of vehicles. In both rulings handed down last month, the U.S. Supreme Court defended the right to privacy even when the parties in question broke the law. The cases were reported in USA Today. They concerned Terrence Byrd who was arrested four years ago in Pennsylvania with body armor and almost 50 bricks of heroin in the trunk of a rental car he was not allowed to drive. A year earlier, Ryan Collins was arrested in Virginia on a stolen motorcycle after he sped away from police. Both men appealed their arrests all the way to the highest court in the nation. The justices overwhelmingly ruled their privacy was breached. The decisions stated police generally cannot enter private property to search a motor vehicle without first obtaining a search warrant. In the case of Byrd, the U.S. Supreme Court ruled 9-0 that the defendant’s absence from the car’s rental policy did not give police the right to search the car. They found by an 8-1 margin that Collins, was protected because police entered his girlfriend’s private property without a warrant. Reports of the dual decisions suggest these vigorous defenses of Fourth Amendment protections against search and seizure are fueled by skepticism about big government and concerns about the advance of increasingly intrusive technology. In 2012, the same court ruled police were not authorized to attach a GPS device to a vehicle without a warrant to monitor its driver’s whereabouts. The court has also ruled that police need a search warrant to look at the contents of the cellphone of a criminal suspect, comparing a smartphone to a computer rather than a personal item like a wallet. The two recent cases may provide a pointer to a decision that will be handed down by the justices over the next few weeks into whether police can use geographic information from smartphone cell towers as evidence of a suspect’s whereabouts. Marc Rotenberg, president of the Electronic Privacy Information Center, said the court is no longer split over the right to privacy with agreement on both political wings. Although the U.S. Supreme Court has ruled that vehicles can be searched without a warrant when a crime is suspected, partially because they can be used to escape from a crime scene, the scope of the automobile exception extends no further than the automobile itself. The new rulings are a far cry from the 1980s when the government usually prevailed in privacy cases. 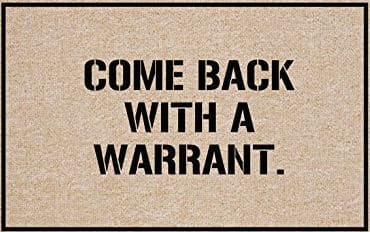 On occasions, police in Texas overstep their Fourth Amendment rights. If your search and seizure rights have been violated please contact our Texas criminal defense lawyers.